In Indiana Jones and the Kingdom of the Crystal Skull, Indy faces many dangers, not the least of which is a swarm of huge, deadly ants. 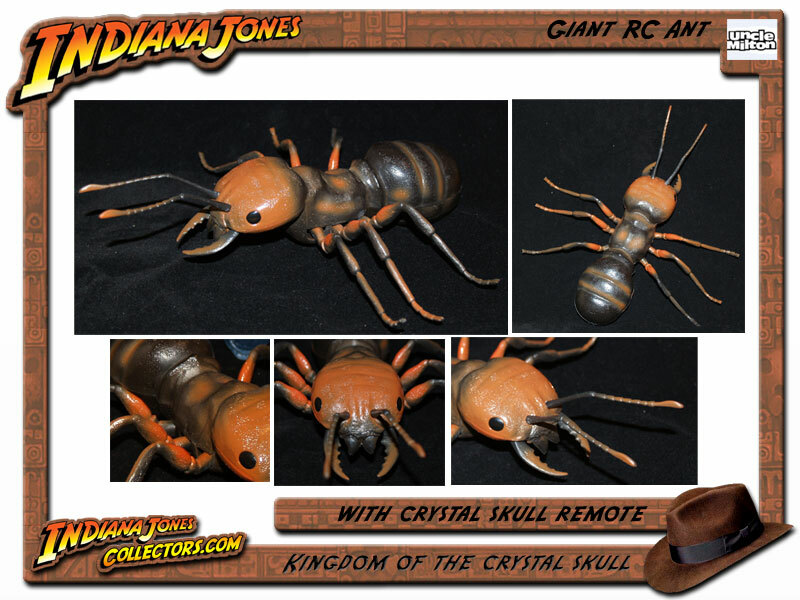 Now, you can control a giant ant complete with realistic jaw chomping mandibles! 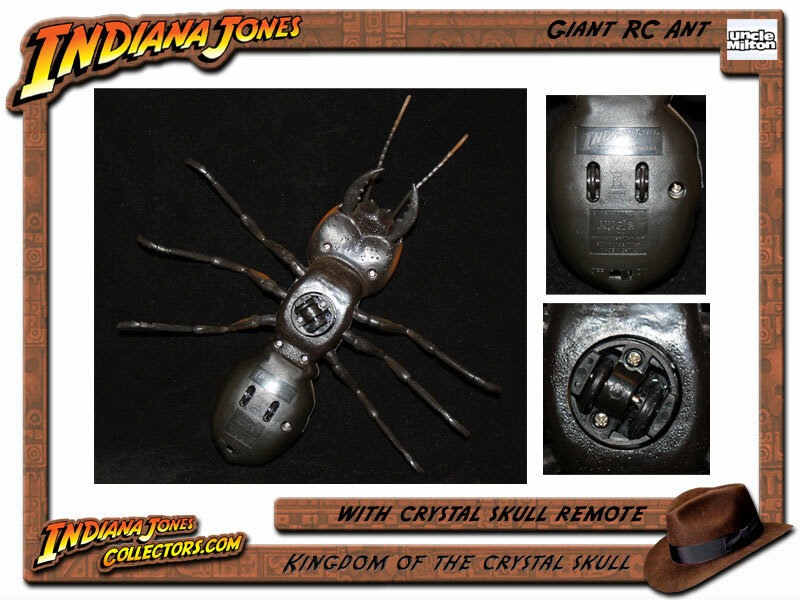 Use the Crystal Skull remote to send your ant scurrying across the floor. It’s ultra-creepy and sure to scare family and friends. The ant is accurate to what was seen in the film, each leg and mandible, the torso, head and back are all sculpted well. 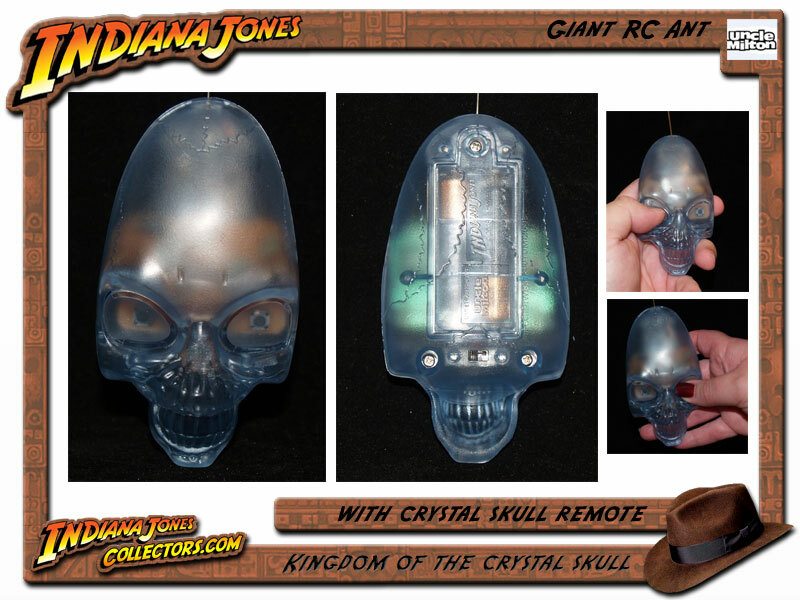 The remote is also well done, with an accurate representation of the Crystal Skull, if it were flattened out. Considering this also had to be a usable remote, the integration of the buttons and placement into the sculpt work well. This remote is a translucent blue, much like other Crystal Skull products, so paint apps do not apply here. The paint apps on the ant are very well done. The paint apps work perfectly and the gradients from the browns to the black and darker browns work well. Uncle Milton did a good job considering the basic colors they had to work with in order to keep it accurate. Here is the reason why you would pick this up: To PLAY with it! It’s a lot of fun for Indy fans and just about anyone who likes nature, ants or enjoys playing a joke on a sibling, wife or friend. The first nice feature is that this is 100% wireless. The packaging of a lot of RC toys in this price range, make the toy look wireless. Then you get it home only to see that dreaded black 10 foot wire connected to it! You will not be disappointed when you unpack this one – NO WIRE! It has great range and functionality. The remote has two buttons. One button makes the ant move forward, the other makes it move left to right in a 360 degree fashion. It is very easy to use for anyone. The batteries are stored in the back on the unit and secured with a screw. Another nice feature usually not found in this price range, but that was included by Uncle Milton, is an On-Off switch. While other remotes have a “time out” after non-use, this remote allows you to turn the unit off when done without wasting battery life. The ant has 6 legs and 2 mandibles. As it moves forward, the legs and mandibles move along in such a way that it looks like it is actually crawling along the floor as opposed to rolling on the small wheels. We tested it on both a smooth floor, as well as, a low pile carpet and it works well on both, but the directions indicate a smooth flat surface and we would agree. While it will work on some carpets, the mechanism under the ant that makes it rotate could become clogged with carpet fibers and hairs, so keep this one on smooth hardwood or smooth floors. I had a lot of fun with this one, and I’m a 32 year old man. It’s quiet enough that I could let it sneak up on my family and get a good scare out of them, while at the same time, my daughter was able to grab the remote and play. Within a few minutes you get used to managing the controls and can control the ant with ease. Our initial thought was that with only two buttons we would be limited in movement, but the 360 degree approach to the rotate button works well and we were able to navigate the ant between chairs, under tables and around corners easily. Without repeating everything we have already said above, if you or your child likes Indiana Jones, this is must buy. Even if they are not huge into Indy but happen to be nature or bug lovers, this would also be a fun toy. Unlike other Indy items we have seen and reviewed, this one really has replay value and long term fun to it. It’s also priced right between $24.99 and $29.99 depending upon where you purchase it. For a wireless remote controlled unit such as this, you can’t beat it. Uncle Milton Industries, famous for the Original Ant Farm® and other innovative, award-winning science and nature-related products really hit a home run with this new line of educational adventure products. This is the first of several reviews (coming soon) for Uncle Milton products. We will review other products as well, like the Lost City Archeology Dig, Room Booby Trap and Crystal Skull Adventure Projector! 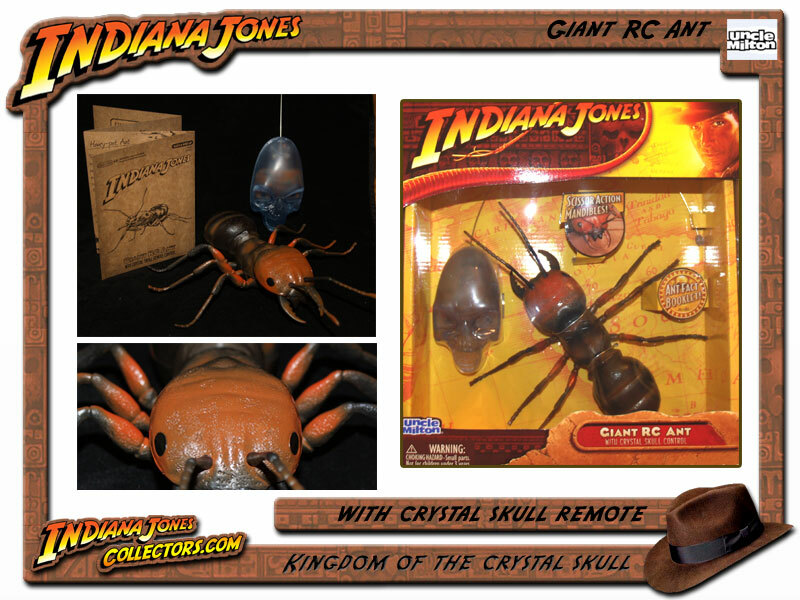 Also, if you would like to take home one of these Remote Controlled Ants, stay tuned to IndianaJonesCollectors.com for a special announcement where we will give several lucky readers the chance to take one of these home for FREE. Sponsored by Uncle Milton and IndianaJonesCollectors. You can purchase these now at several online stores like Amazon, SpeedyDog, Target and others. You will also find these on the shelf this Holiday Season in most of your favorite stores. They are stocking shelves now! This site is in no way affiliated with Lucasfilm Ltd. or Paramount Pictures. The site is updated and maintained by Fans of the Indy Movies and Collectibles. Copyrights and trademarks for the films, books, articles, and other promotional materials are held by their respective owners. This is a fan site for collectors of Indiana Jones Toys and Collectibles. IndianaJonesCollector.com, JonesCollector.com and IndianaJonesCollectors.com are owned and operated by Kid4Life LLC. All Rights Reserved.